When the holiday season is said and done, everyone gets to thinking about packing up Christmas décor. Maybe your focus is on your home, you’ve fully decorated, celebrated, and sent out gifts, and now you’re looking at post-season storage. Or you’re at work, having shipped out the season’s orders, decorated the office, and celebrated with co-workers, and now you’re charged with putting it all in storage and making room for the new year’s products. No matter what you’re doing, The Packaging Company has got you covered. Let’s take a good look at the packaging supplies you’ll need to pack up your home or workplace’s decor and make your year-long storage simple and easy. First, pick a date to take everything down. If you have a real tree, choose a day that’s just before Christmas tree pick-up, so it’s not hanging around the house. And put on some music, it makes everything go faster and feel like less work. Plastic boxes are ideal for packing away Christmas decorations, as they keep out light, dirt and moisture. Wrap individual ornaments in tissue paper or foam, using more to create layers of ornaments in the box. If they’re on the more fragile side, keep them separated using corrugated divider kits. If you’ve kept the boxes your LED lights came in, they’ll easily stack in storage. If not, simply coil them up, use twist ties to keep them together, and layer them into their own box. That box full of ornaments will do as well, if it’s not too full of fragile decorations. Outdoor decorations and Nativity Scenes can be packed into strong corrugated boxes with packing paper or bubble cushion. Indoor décor such as centerpieces, tablecloths, towels and garland (don’t forget the stockings!) 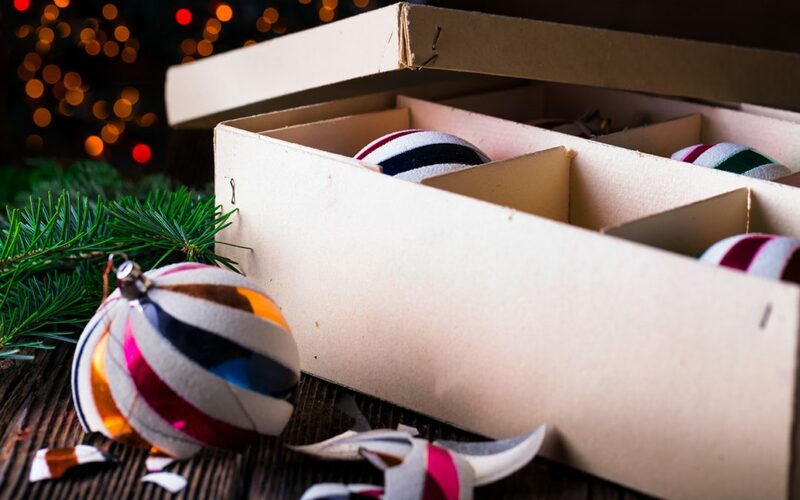 store well in plastic boxes—also, fabric and cloth items can even be used to wrap around and protect other decorations. Our flat screen TV storage boxes work great for storing those giant door wreaths that you can barely fit back inside. And finally, that artificial Christmas tree that won’t go back into its original box will find a comfortable home inside a Space Saver Wardrobe Box, and the reinforced hanging bar inside is yet another place to hang and store more decorations. One of the great things about working in an office is you’re not alone. Taking down all those decorations and cleaning up after the office party isn’t all on you. So recruit, recruit, recruit and the project becomes a whole lot easier. Regular corrugated boxes can sometimes be tough to find in an office, but it’s likely that there are plenty of plastic boxes and file boxes (also known as bankers boxes) on hand. These are great for storing and stacking away nearly everything in sight. Christmas decorations don’t stand a chance. Take a moment to organize everything into groups. Wall decorations, garland and desk décor, tablecloths, any trees and their ornaments, and party supplies like cutlery and cups. This way, sorting and packing moves quicker and next year, it’ll be even easier to grab the supplies you need. Glasses, punch bowls, plates and trays, cutlery and napkins can all be stored together, especially if they’re plastic and not reusable. Otherwise, a little bit of bubble cushion or packing paper will keep everything nice and separated and in perfect condition for use next Christmas. If your office trees are artificial, chances are you’ve got the place to store them. And if their decorations don’t change much from year to year, consider wrapping up the tree, decorations and all. A little stretch wrap will keep the tree and its contents in place, and some extra bubble will help it survive the next few months in a supply closet. Then, once Christmas comes around again, unwrap it, fully decorated and ready to go. You’ve probably noticed that our tips for packing up Christmas at home easily apply to packing up Christmas in the workplace, and vice versa. With a little ingenuity and the right supplies, you can take down, clean up, and store away everything you won’t need until next December. We hope you’ve had a great Christmas, and are looking forward to the year ahead. The Packaging Company is your source for the packaging supplies you’ll need to wrap up this season and the next.